Emperor Ravana lived nearly 1.5 million years ago in Sri Lanka. He was a descendant of ‘Surya Wansha’ of ‘Hela Yakka’ tribe (ancient Sinhala tribe). King Ravana was one of the best fighters in Angampora, the traditional martial arts of ancient Sinhale. He was a great Scholar in Ayurvedic medicine. He was the person who invented “Arka Shastra”. The book “Arka Prakshaya” reveals this truth to the present world. As his willing to research in Ayurvedic medicine he wrote several books revealing the cures for many diseases. In one book he wrote “Eating beef cause to infect ninety eight new diseases to human beings”. The book “Kumara Tantraya” which reveals the treatments for infant diseases was written by him accepting the request of his pregnant queen Mandodari. His eldest son was Indrajith also known as Meghanada who followed his father’s steps. There are some hints in Sri Lankan rock inscriptions about the daughter of king Dasis Ravana. 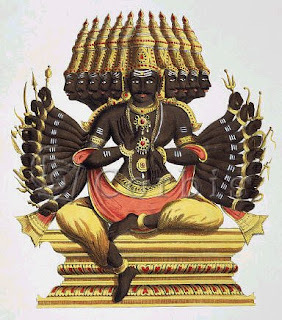 King Ravana’s kingdom was Lankapura. The kingdom is almost disappeared today. But if you keen on Sri Lankan folklore and ola manuscripts there you can find some remaining sites of Lankapura today known as Seegiriya and Trincomalee. King Ravana invented the bow of Violin. He also narrated very first Raagas, the musical compositions of Eastern classical music known as Lanka Dehena. “Siva thandawa” is one of the great devotional compositions done by him, which is still being in use in India. He was the first king flew over the world with his aero plane, known as Dandumonaraya, Vimaanaya or Ahasthara. Some evidence of Dandumonaraya the aeroplane is found in Rock inscriptions, Jataka Stories and Ola manuscripts. The Sinhalese folk stories are enriched with Ravana Stories. King Ravana was continuing a vegan oriented life style and was a real nature lover. According to Lankavatara sutta he was Buddhist and worshipped Kashyapa Buddha. Once he invited Kashyapa Buddha to visit Lanka and deliver his sermon to Sri Lankan citizens who practice yoga and follow Buddhism. Today the time has changed and many of us do not know the real history of king Ravana and throw our folk tales away without considering any valuable parts of them. King Ravana was one of the best emperors found in Sri Lankan history. There are more than 300 Sinhala village names related to king Ravana era. In addition, there are some more places and remains in which the Rama Ravana war took place in Sri Lanka. The Ramayana is not part of the mainstream Sinhala religious and cultural tradition in Sri Lanka, because Buddhism has been the religion of the majority of Sinhalas for long. But ancient Sinhala works like Rajavaliya and Ravanavaliya identify Ravana as a Sinhala king and extol him as a great one. 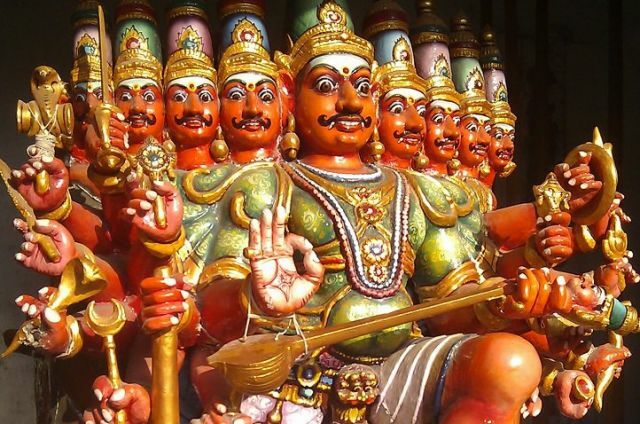 In modern Sri Lanka, there has been a movement to revive Ravana as a cult figure, who represents Sinhala or Sri Lankan nationalism because he was among the first in the island’s history to have resisted an alien/Indian invader. Scholar Arisen Ahubudhu is the current representative of the ultra nationalistic Hela movement founded by the renowned Sinhala litterateur, the Late Munidasa Kumaratunga. The Hela movement has been urging the Sinhalas to go back to their roots shunning Indian, Hinduistic and other alien influences. In his book Sakvithi Ravana (first published in 1988) Ahubudhu says that Ravana reigned over Sri Lanka from 2554 to 2517 BC. He quotes Ravanavaliya to say that Ravana belonged to the “Sun race” as Ra signifies the sun and vana signifies generation. Ravana’s ten heads represent the ten crowns he wore as a result of his being the sovereign of ten countries. Ravana’s ancestors ruled over what is now the Polonnaruwa district in North Central Sri Lanka, the name Polonnaruwa being a derivative of the word Pulasthi, the name of the dynasty to which Ravana belonged. Ravana, however, ruled over the entire island and many places beyond. Ahubudhu trashes the Ramayana story that Rama invaded Sri Lanka because Ravana had kidnapped Sita. According to the author, Ravana’s step brother Vibhishana, had invited Rama to invade Sri Lanka because he was wanting to oust Ravana from the kingship of the island. 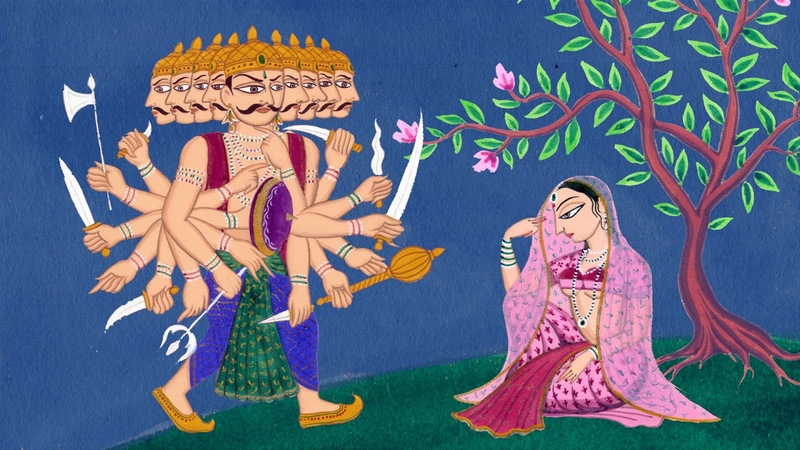 “When considering the fact that Sita’s chastity was proved, this can be taken as a story concocted by Yuwaraja Vibhishana in order to discredit Ravana in the eyes of his people and take advantage thereof,” he says. According to Prof Buddhadasa Hewavitharana, the Sinhalas disapproved of Vibhishana’s conduct. In popular lore, the area to which he belonged to (Kalutara North, near Colombo) came to be known as the land of the Desha Shatru (betrayer of the country). Sinhala lore has it that Sri Lanka under the scholarly Ravana saw great advancements in science and medicine. The pushpaka vimana or the aeroplane which he flew, was no figment of imagination, they believe. Ravana holds a high position even as a physician and there exists, to this day, seven books on medicine in his name. According to Munidasa Kumaratunga, Ravana’s medical works Nadi Pariksha, Arka Prakashata, Uddisa Chiktsaya, Oddiya Chikitsa, Kumara Tantraya and Vatina Prakaranaya were originally written in Sinhala and translated into Sanskrit. Even Indian lore extols Ravana as a Shiva Bhakta and as the composer of the Shivathandawa Stotra. 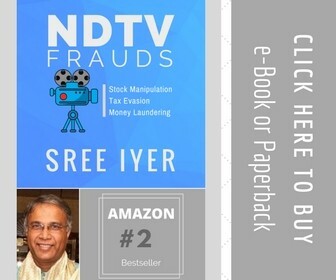 He was a musician, who had fashioned his own stringed instrument called Ravana Vina. “The Ramayana may not be in the mainstream of the Sinhala religious culture.But it is very much a part of Sinhala folk lore,” says Prof Hewavitharana. There are places in Sri Lanka which are still identified with the Ramayana, like the Sita Eliya in Nuwara Eliya district, where there is a temple dedicated to Sita on the banks of a mountain stream. As per local legend, this was the place where Sita was confined by Ravana. Then there is a hill called Ravana Elle, which was supposedly the headquarters of Ravana. There is a temple for Vibhishana in Dondra in south Sri Lanka, even though he is derided for supporting the invader Rama and letting down his brother Ravana. Sita, Bharata and Lakshman are popular Sinhala names.